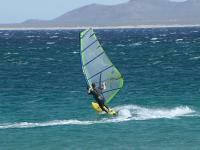 We use some simple definitions to assess your windsurfing skill level. If you learn how to recognize the different skill levels, then you can assess yourself and decide what skills to learn next. Pre-level 1 You are at this level if you haven't windsurfed before, or you have windsurfed but would only feel comfortable getting on the water after completing a refresher lesson. 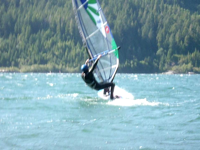 Demonstrate basic skills: windsurfing stance, uphaul, equipment care, tack to return to shore, steering, landing, self-rescue, points of sale, basic sailing and safety standards. 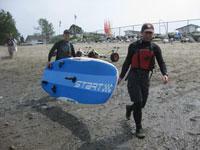 Follow club procedures for taking out equipment (identifying our gear, sign-out, transport, noting damages, time-limit). 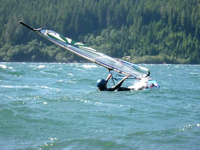 Come to a Windsurfing Checkout where a Windsurfing Fleet Captain or the Windsurfing DIrector will go over club procedures for taking out our equipment and get you to demonstrate the on water skills listed above. 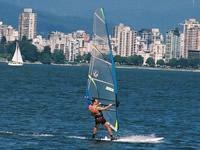 If you successfully complete the checkout, the Fleet Captain or Windsurfing Director will update your member profile to indicate your Level 1 Windsurfer status and you will be able to take sign out level 1 gear in our craft signout computer. 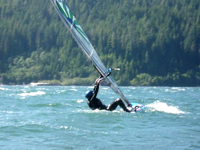 Get the basic windsurfing skills by taking Club Locarno's in-house Beginner Windsurfing Lessons, or take a windsurfing lesson program from a windsurfing school such as Windsure or at a windsurfing hotspot such as the Gorge (Hood River, OR). 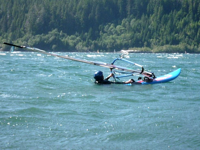 The main objective in the beginner lessons is to be able to sail out from shore and return and know how to stay safe on the water.